Create another user account (local) on your computer. Open registry find and replace tool, and make sure you put a \ on the end so you search for C:\Users\danie\ and replace with C:\Users\Daniel\ Otherwise you may overwrite any correct ones (search and replace on C:\Users\danie will rename C:\Users\Daniel into C:\Users\Daniell – which is almost as bad as danie. Once search and replace is complete, Log off and then back on again as your original account. 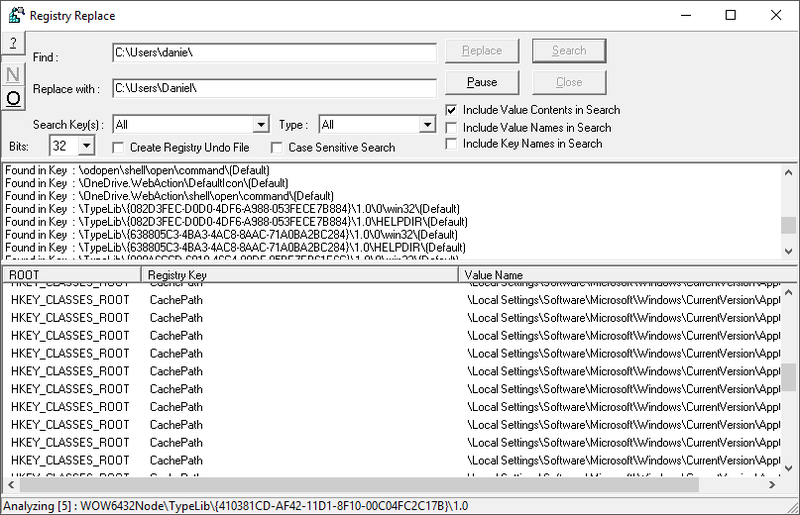 Run search and replace again – some of the keys are only accessible if you are logged on as the user. Don’t forget the trailing \ !!!! Set up One Drive again, plus some other programs that will get cranky too. It would be wonderful if Microsoft allowed you to change the folder name. I have a bunch of batch files that refer to the \Daniel\ folder, as well as some virtual machines and settings that I copied back after a format re-install that had the \Daniel\ folder name. Plus the fact that I just can’t stand having “danie” as the folder name. It just bugs me too much. Next time I do a format reinstall I might create a local account first called Daniel and then upgrade it to a MS account? That is how I ended up with the Daniel folder name on my previous install – not sure if you can do that a second time.